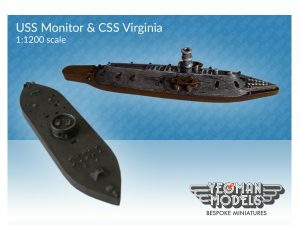 The USS Monitor and CSS Virginia were the first and most famous ironclads, and their unique designs changed the warship forever. The USS Monitor was a wholly new ship with revolutionary design and rotating turret. She launched on the 30th of January, 1862. The CSS Virginia was the wooden ship USS Merrimack that was burnt down to the waterline in 1861. The Confederate army raised the remains of the hull and converted it into an ironclad. Both ironclads fought at the Battle of Hampton Roads on March 8, 1862 but neither ship could get the upper hand in the battle. Both ships sustained damage and in the confusion of war, both ships believed they won the day! After the Battle of Hampton Roads the CSS Virginia retreated and unable to manoeuvre further up the James River, the captain scuttled the ship and destroyed it. The USS Monitor sank in high seas off Cape Hatteras on December 31st, 1862 – only 11 months after her launch. The Turret of the USS Monitor can be seen at the The Mariners’ Museum in Virginia, USA at the USS Monitor Centre. The image above are ones that I painted from unpainted resin casts that can be bought from yeomanmodels.com or my ebay page, but they are now available on Shapeways!